Retail is often about making a strong first impression and we hope that our range of products will help you to achieve this. Having worked with a number of retailers in the past, we understand that attention-seeking and value for money are both important and buying an off the shelf solution is much better value for money. Our pre-designed range of fabric structures offers not only the highest quality but also excellent value for money. In a retail setting, you may be looking for a fabric solution for a variety of reasons: to protect your customers from getting wet in a carpark, to draw attention to the location of your entrance, or simply to create a 'wow' in your atrium with some feature sails, promoting your brand. We hope that our wide range of options will provide you with the perfect choice. 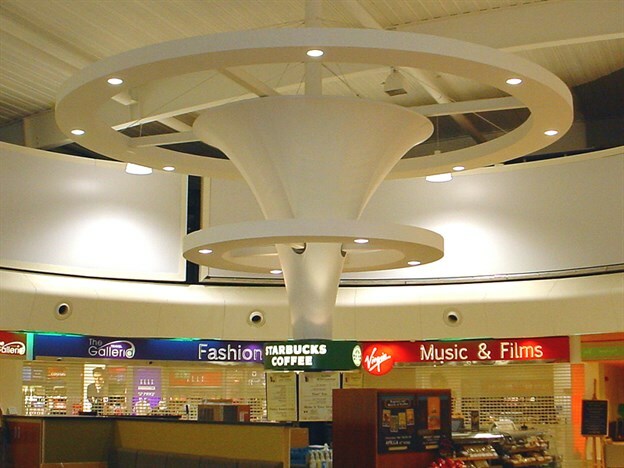 If you are suffering with poor acoustics in your retail establishment, our pre-designed acoustic solutions not only improve and reduce sound reverberation, but also provide an attractive fabric feature perhaps being printed or projected onto. All of our pre-designed products are easy to specify and quick to install. Whatever your requirements, we have a solution to help you. Not seen what you're looking for? We do also offer a full bespoke service. Check out our bespoke portfolios for exterior structures, interior features and acoustic solutions, or contact us to discuss your specific project requirements.